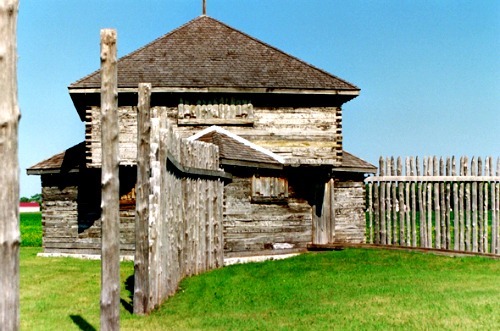 Fort Ambercrombie was the first military structure to be built in North Dakota. It was commissioned on March 3rd, 1857 as part of a plan to guard the settlers and traders moving through the area, though it only lasted for 3 years. In 1860 another fort was built slightly to the north of this one due to the area being prone to flooding. The fort did see a little bit of action in its life, as when it was not flooded it was garrisoned by troops, and during the Dakota war of 1862 it was besieged for 6 weeks. The local Indian tribe, the Sioux, increased their activity in the area and managed to cause groups of settlers to flee to the fort in fear of their lives. Over the next 6 weeks the Sioux would attack the fort, alternating between long distance sniping and full on attacks from all 4 sides. Even though this sounds like it would have caused a lot of casualties there were only 4 deaths and 2 soldiers wounded during the whole of the 6 weeks. The Sioux were not so lucky since the defenders had rifles, shotguns and howitzers, causing significantly more deaths on the attackers side. In 1877 the fort was abandoned due to it simply not being needed any more and the original buildings were either sold or demolished shortly afterwards. However during 1939 three of the blockade houses and the stockade fence were rebuilt and today are open to the public. The majority of these old style log and mound forts are thought to be haunted, and normally the reason why is often because of the violence that happened here, and Fort Ambercrombie seems no different from the others in terms of its ghostly inhabitants. The most common claims of paranormal activity here include the sightings of apparitions and strange sounds in the area. There are even some who claimed to have witnessed the spirits enacting the battle that took place here in the year of 1862 during the siege, with stories ranging from union troops firing from the walls to the charging horses of the Sioux. These claims seem a little strong to me and such vivid sightings are extremely rare at best, though the other most common claim from here seems a little more possible. Often people have said they heard battle sounds as if coming from the distance, including the feint boom of the guns and trampling sounds of many horses charging.